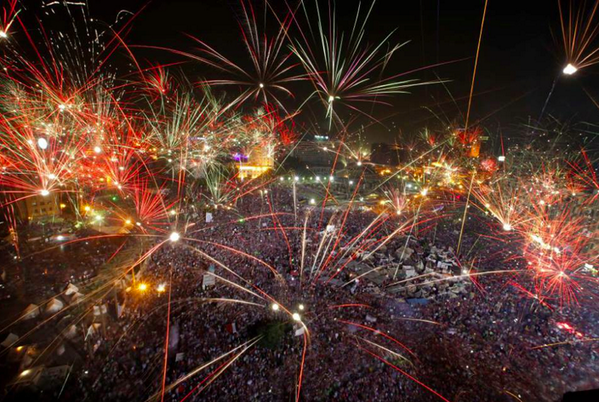 So, Morsi has been ousted and scenes of the celebrations in Cairo’s Tahrir Square have been flashed around the globe. As an outsider to Egypt I find it hard to take a definitive view of the happenings in Egypt this week. The closest thing I can compare it to is trying to look inside someone else’s marriage. Only the people on the inside really know the truth. It’s easy to take a ‘superior’Western view and claim the Egyptian’s first foray into democracy has been a disaster. But I’d hesitate to take the moral high ground when one looks at the history of bloodshed in the West through which, arguably, our own democracy has been won. Although perhaps our willingness to stand by our own decisions is telling. As a friend of mine said, ‘when we choose the wrong government – and when did we ever choose the right one – we live with it.’ That’s democracy. I guess the scenes of mass celebration tell their own story, with some Egyptians claiming they have now completed the revolution they started in 2011. The governments in the West state they cannot support the military intervention in Egypt that has removed a legitimately elected president. A cynic might say of course not. For how precarious might that make their own position? And the media reporters comment sagely about the precedent set as ‘the people’ make it clear that if they have the power to remove one elected president, they can surely do so again. But was Morsi the architect of his own downfall? At the risk of writing a political blog and as an outsider, I think my view would be yes. I certainly heard no words of conciliation or compromise in the speech he gave earlier in the week. The rot seemed to set in when he granted himself what one reporter called ‘Pharaonic’ powers in November last year – although under extreme pressure he rescinded most of them. And it’s clear he was presiding over a sinking economy. As a regular tourist to Egypt, I was dismayed on my last visit in April, to experience the almost-daily power cuts and to see the queues for cooking gas. And Morsi seemed intent on killing the already afflicted tourist industry stone dead. His decision a couple of weeks ago to appoint as Governor of Luxor a man implicated in the terrorist atrocity at Hatshepsut’s Temple in Luxor in 1997 seemed calculated to ensure tourists wouldn’t venture back to Egypt but surely succeeded only in hastening his own departure from office. The people rejected him for promoting an Islamist agenda. And so he now languishes under house arrest and the military run the show once again. Some might say there is nothing new under the Egyptian sun and history has an interesting habit of repeating itself. It’s possible one of the first military coups in Egypt was led by General Horemheb at the end of the once-glorious 18th Dynasty, famous for such names as Hatshepsut, Thutmosis III and Tutankhamun. More recently, in 1952, the Association of Free Officers that ultimately saw President Nasser come to power, led the movement to topple the monarchy and remove King Farouk from his throne. Nasser is now feted as one of the towering political figures of modern Middle Eastern history and politics in the twentieth century. Interestingly, he distrusted the Moslem Brotherhood, and did much to clip their wings. Let’s hope there’s someone waiting in the wings in Egypt now who can lead the country on to better days. So, moving from these political musings to some more personal musings. Where does all this leave me as the writer of a series of adventure/mystery stories set in present-day Egypt? My first three published novels are set in the period May – December 2012, when things were relatively calm; although the post-revolutionary landscape provided a useful backdrop to the stories. Each of these adventures has a link to ancient Egypt’s 18th Dynasty. My current novel, to be published next month, uses the more modern history around King Farouk’s removal and subsequent exile as its basis. I’m wondering, with the British Foreign Office’s rulings against all but essential travel to Egypt whether I may be forced to bring Merry and Adam home. Perhaps these are the risks a novelist must take in deciding to set her series in such turbulent times. The trouble with not writing purely historical books is not knowing the ultimate outcome. All I can do is hope and pray that Egypt can return to a more stable footing and happier times. Posted on July 5, 2013 by Fiona Deal. This entry was posted in ancient Egypt, Egypt, egyptian fiction, fiction, History, Travel, Uncategorized, writing. Bookmark the permalink. please dont send Merry and Adam home, but let them stay and experience this important part of modern history. Your view on this whole situation is true and not colored by any political party or religion. It may sound strange, but we need comments as yours to make the Westerns understand why you and I love Egypt so much, they have to be aware of the struggle of the Egyptians, more than 2000 years of occupation, being robed of all their land’s riches, no experience in democracy what so ever. They have to learn for themselves, learn to make choices for themselves. We need your support. Dont send Merry and Adam home but let them tell our story. I won’t send Merry and Adam home unless forced to under a repatriation decision imposed by the British foreign office. And, even then, I don’t think the powers that be here in the UK can force British nationals to leave Egypt if they choose not to. I have an inkling of an idea for a fifth book that would allow Merry and Adam to stay in Egypt and experience this latest popular uprising. The current story (nearly finished) is set in the spring of this year so there’s every chance… I agree with everything you say about the feelings of Egyptian people. The last people to occupy GB were the French under William the Conquerer of Normandy. I’m still not sure we’ve forgiven them for it !! Stay safe as these dark days of Egypt’s modern history unfold around you. If my books go some way to giving you some support then I’ll write as many as I can. Egypt was once the most glorious nation on earth – much of it still is. The people are among the most friendly and welcoming on earth. I hope more than anything that your once thriving tourist industry can come to the fore again so others can experience the wonders that have made you and me fall in love with the place.